I went down to my parents this last weekend for Easter. It was a great trip, but the nicest part was a hike that my wife and I took. There was a lot of rain this last weekend, but on Saturday everything cleared up for a little while. My family had a big get together, and an Easter egg hunt. Of course after everything and after the cold weather I decided to head after a cache. There was a cache up the canyon near my home that had not been found often. In fact I had looked for it another time and the coords had placed me up a steep rocky slope and scrambling to keep from falling to my death. Well this time he had updated his coords and we decided to head up and check things out. So my wife and I took some free time and broke away from the family that were mostly just relaxing and eating candy. We headed up to the mouth of the canyon. Like many of the canyons the mouth of this one is full of a lot of trash. A lot of trash, targets, and many other items that people have dumped. I grew up near here and had hiked the canyon many times, but for my wife this was a first time up this canyon. It is really impressive and I love the rock formations. There are a few old lime kilns from 80 years ago, one at the mouth of the canyon, and another that is ways up the canyon. We hiked up the canyon and we looked for a while for the cache. The cache had been placed right under a small gully. It had a small crack in the lid so the entire thing was full of slimy nasty stuff. I could not even get the log out, and when I got water on my hands they stank for some time. It was vile. In the end I moved it about six feet out of the gully and into a sagebrush. I put a rock on top of it and hopefully that will help keep the water out when things finally dry out. After that we started to walk up the canyon. We headed up another quarter of a mile before we reached a small box canyon where I found a place to hide a new one. These canyons do not get visited much, and the caches do not get visited much either. They are kind of off the beaten path. 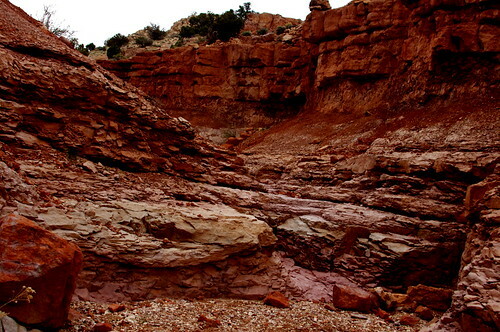 There is not much growth and many parts of the canyon are scoured clean of rocks and dirt. 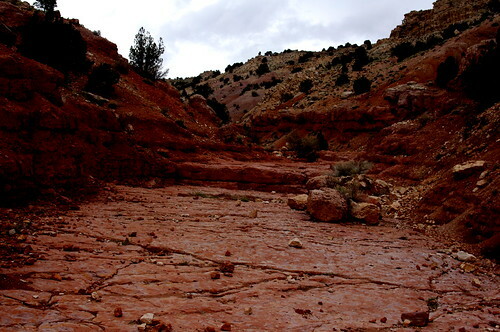 The rains tend to clean all the waist out of the canyon and dump them on the roads below. In all we spent a few hours up here. I hope to go back and visit more, someday. There are more to find, and more caches to place. I received an email request to add an Oldest cache in Idaho list, and favorites. I do not plan on adding all the links (because of the time it takes) like I did with the oldest 100. I took the time to play in Excel, and I sorted out the favorite 60 caches in Utah. I was happy to see that at the moment I had 14 caches that had a favorite point. It cheered me up to think that someone liked my caches enough to list them as a favorites. Next spring will be two years and some will need an overhaul for the upcoming year. The list does no have any multicaches, wherigos, webcams, or letterboxes. There were none in the top 60 that were listed, so though some have points.. they did not come up on my list. Next time I may go to the top 100. That should add a few more. I will update this periodically and see what the changes are.